Surely, the pianist Makiko Hirabayashi Trio's third album, is both utterly captivating and immediately enjoyable. It is also, however, rather disquieting to anyone who listens more deeply because this music flatly refuses to be pinned down. Here, the whole is much more than the sum of the parts, but the parts remain in paradoxical relation to each other. For sure, the question, "What is Jazz?" will not be answered by Surely. Hirabayashi's, and by extension, the Trio's, art is full of seeming contradictions: superficial simplicity is supported by subtle complexity; harmonically, it is neither "in" nor "out"there are no harsh dissonances, but also no simple "changes" (with one exception); the music moves, yet seems circular; each track has a very different musical identity, yet each most definitely is an extension of the Trio; the music, even in the more overtly "deep" tracks has a floating lightness, and yet Hirabayashi always plays to the bottom of the keys; it is "music of the world" and yet not "world music"; its rhythms move the body, yet "groove music" it is not; the happiness of musical creation exudes from every track and yet, just as evident, is an intellectual rigour that is not merely happy, but actually introspective; finally, this music is wide open and inviting while remaining essentially mysterious. Putting it all together makes for an album that can be listened to repeatedly, with deeper layers being revealed each time. The band is a true collective where Hirabayashi's pianistic gestures are supported, caught and returned by drummer/percussionist Marilyn Mazur. Bassist Klavs Hovman is recorded not just under, but around Hirabayashi and Mazur, enveloping and supporting them. The interplay among the players is very fast and crisp, even delightful. If the exception proves the rule, then the jarring effect of "Stepping On It" itself, and especially when heard immediately after "Life Of A Cactus," is telling. The tune initially sounds like it could be something by Ramsey Lewis; there are clear (bluesy) I-IV changes with a standard (but highly disguised) turnaround. This is nothing like what has preceded, creating a shock to the ear since the sound world of "Life Of A Cactus" does (in retrospect) evoke (somehow) a harsh, dry, rather lonely environment in which there is a struggle to survive. However, after the exposition completes, the improvisation does everything but reference the tune's head, making its return surprising once again. Surprising simplicity indeed. Placing the title song first is surely a statement of purpose, but also some more playful deception, because this track has the most overt feel of folkish world music. However, the following tracks immediately veer away from any other distinct cultural allusion. "Moon Bells," (track 2) and "Black" (track 6) are a pair of short group improvisation that extremely distant from each other. Other short tracks are two solo efforts by Hirabayashi, with "Parachute City" exploring both atonality (with a very quick, and shocking blues figure) and free rhythm, while "Indigo" explores the deeper regions of the piano. The remaining short track, "Challenge" is by Mazur, and which opens and ends (unsurprisingly) with a rhythmic figure. The rest of the tracks are longer and are quite different from one another, building and then dashing expectations. "Ode To Okinawa" has nothing discernibly to do with Japan as it flies joyously up into the sky, only to followed by "Eagles And Angels," which has the deepest groove and is almost funky. "Asunder Asunder" begins with light marimba sounds and then dances over a throbbing bass, only to be followed "Life Of A Cactus." Arguably the deepest and most intense tracks are "Vad Vinkel" and "Paradox," which follows. Both are journeys to distant places, evoking large spaces filled with mysterious, ethereal and a touch dangerous, beauty. What is melody or harmony or rhythm? Surely is a magnificent creation that stands resolutely defiant, beckoning while withholding its secrets. Track Listing: Surely; Moon Bells; Asunder Asunder; Life Of A Cactus; Stepping On It; Black; Ode To Okinawa; Eagles And Angels; Parachute City; Vad Vinkel; Paradox; Challenge; Indigo. 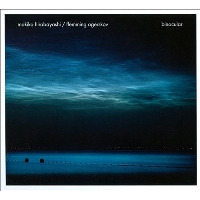 Personnel: Makiko Hirabayashi: piano; Klavs Hovman: bass; Marilyn Mazur: drums, percussion, voice.